If you’ve ever rented a car, you’ve probably been warned by salespeople at the counter about the possible consequences of walking away without buying their company’s rental car insurance. Put on the spot, you might not feel confident about exactly what your current auto insurance covers. And that’s what rental companies are counting on — along with their commissions for selling you the coverage. Want to be prepared next time you’re renting? We can help you understand whether you need rental car insurance and how to get it before you get to the rental counter. Rental car insurance or your own auto insurance? 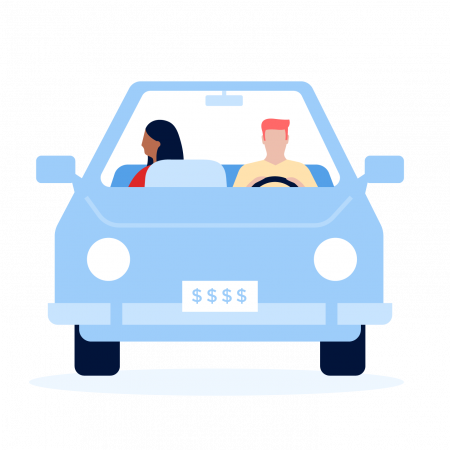 Here are the typical insurance options from rental car companies, along with how to determine if you already have coverage within your own auto insurance policy. Coverage from your own policy applies when you are using a rental car for personal, nonbusiness purposes. The rules may be different for business use of a rental car. Check with your insurer or employer for details about coverage when using a rental car for business. At the counter: A loss-damage waiver (LDW), also called a collision damage waiver (CDW), gets you off the hook for any damage to the rental vehicle or theft of the car. It’s technically not insurance but rather a waiver that says the rental car company won’t come after you. Your policy: If you have collision and comprehensive coverage on your own policy, it generally will extend to a rental car. However, you will still be on the hook for your deductible. At the counter: Supplemental liability protection will pay for damage you do to others’ vehicles or property. A typical limit is $1 million. If you have no auto insurance (for example, if you don’t own a car), you should buy this. Your own policy: Your own liability insurance will cover you when you’re driving rental cars. If you have really minimal liability coverage on your auto policy, you could buy the supplemental protection to boost your coverage. But if that’s your situation, you’d be smarter to increase your own liability coverage anyway. At the counter: Personal accident insurance covers medical costs for you and your passengers if you’re involved in an accident. This includes ambulance, medical care and death benefits. Your own policy: If you have health insurance, this coverage would largely be redundant. Similarly, if you are interested in death benefits, you should have a life insurance policy. Personal accident insurance also is not needed if you have personal injury protection or MedPay through your auto policy. At the counter: Personal effects coverage pays for your belongings if they’re stolen from the rental car, up to a set dollar amount. Your own policy: Your homeowners or renters insurance will cover your possessions if they are stolen, even away from home. To make a theft claim, you’ll need to file a police report, and your deductible amount will apply. Credit cards often provide coverage for rental cars, assuming you have used the card to pay for the rental and the rental is in your name. You’ll automatically have this coverage if it’s included with your credit card — no need to call or sign forms. But it is secondary coverage, meaning your own auto insurance policy will pay out first. NerdWallet assessed credit cards that offer good rental car insurance. If you don’t have auto insurance and are going to count on credit card coverage, call your credit card issuer to confirm the details. There are companies that sell standalone policies for rental cars if you don’t want to buy insurance at the counter. You generally need to decline the rental company’s coverage to use these. Allianz Global Assistance sells a Rental Car Damage Protector for $9 a day that pays out up to $40,000 for damage and loss. It’s primary coverage, so it pays out before your own auto insurance, and includes 24-hour emergency assistance. Bonzah sells insurance starting at $7.99 per day that pays out for up to $35,000 in repairs or replacement of the vehicle. It’s primary insurance, so it pays out before your own insurer. Policies generally cover travel abroad, but check the fine print. Insure My Rental Car offers loss damage waivers covering up to $100,000 in damage to your rental vehicle. You can purchase coverage for anywhere from a day (starting at $7.50) to a year (starting at $93.99). The policy provides primary coverage so you don’t need to use your own auto insurance first. Policies also extend to rentals outside the United States. Do You Need 'Non-Owner' Car Insurance?